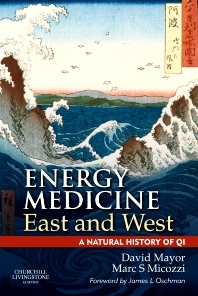 Energy Medicine East and West: A Natural History of Qi provides a unique, comprehensive overview of Qi or bioenergy for students and practitioners of energy medicines, Chinese and Oriental Medicine, and all disciplines of Complementary and Integrative Medicine. Mayor and Micozzi start with a comparative historical account of the ancient concepts of Qi and vital energy before covering theories of Qi, a discussion of the organized therapeutic modalities based upon Qi and its applications to specific health and medical conditions. Contributions are included from international experts in the field. The book moves from anatomical and bioenergetic complementarity of Western vital energy and Eastern Qi, through convergence of perspectives and models to demonstrations of how the traditional therapies are being melded together in a new, original and creative synthesis. David Mayor and Marc Micozzi are experienced medical practitioners, authors and editors. David Mayor has been actively involved in bioenergy research, practice and publishing for over 30 years, and is author/editor of Electroacupuncture: A practical manual and resource (2007), as well as other acupuncture texts and studies. Marc Micozzi is Professor in the Department of Physiology and Biophysics at Georgetown University School of Medicine, Washington, DC. As author/editor of Fundamentals of Complementary & Alternative Medicine, 4E (2011), and 25 other books, he has been writing, editing and teaching on bioenergy, Qi and related topics for 20 years. "This wonderful book has assembled some 25 authors expressing well a view of qi which entirely does justice to its nature. Meticulously referenced, it is a milestone to set beside Maciocias Foundations of Chinese Medicine and Deadmans Manual of Acupuncture. Here at last are the beginnings of a true science of qi...There is truly nothing like it in contemporary literature. Alone, it lays the foundation for the beginnings of a modern science of qi. "Richard Bertschinger, Acupuncturist and translator, Somerset, UK. "This book offers a timely and thorough examination of the experience and nature of qi, including a series of fascinating philosophical discussions with a direct application to our patients. Required reading for acupuncture practitioners seeking to justify and clarify their clinical reasoning. "Val Hopwood PhD FCSP, Physiotherapist, acupuncturist, researcher and educator; Course director, MSc Acupuncture, Coventry University, UK. "Over the last decade most books on Asian medicine paid tribute to the aura of evidence-based medicine – experience counted little, RCTs were convincing. This book, at last, returns to an old tradition of debate, opening up quite a few new horizons. Reading it, my striving for knowledge was married with enjoyment and happiness. This book made me happy!" Thomas Ots MD PhD, Medical acupuncturist specialising in psychiatry, Graz, Austria; Editor-in-Chief, Deutsche Zeitschrift für Akupunktur. "To simply review the chapter headings is to know the truly remarkable expanse of this book...a wonderful bridge between the mysteries of the East and the sciences of the West...well documented, well written, and enlarging both. Enlightening...nicely depicts outstanding advances in energy psychotherapeutics, thus ultimately helping to move forward the human condition. "Maurie D Pressman MD, Emeritus Clinical Professor of Psychiatry, Temple University School of Medicine, Philadelphia, PA; Emeritus Chairman of Psychiatry, Albert Einstein Medical Center, Philadelphia PA; past President, International Society for the Study of Subtle Energies and Energy Medicine, Lafayette, CO, USA. "...a major advance in the study of qi and related forms of 'energy medicine,' both in and beyond the East Asian cultural context...bringing together such a wide range of scholars and practitioners, providing much the most serious and thorough overview of the area yet available in English. "Professor Geoffrey Samuel, Director, Research Group on the Body, Health and Religion (BAHAR), Cardiff University, UK. 13. What does it mean to practice an energy medicine?